“The Future” of Supernatural may not be quite what we expected. Misha Collins returns to Supernatural, giving us a wonderful performance as Castiel experiencing a crisis of conscience. “The Future” was written by Robert Berens and Meredith Glynn. Amanda Tapping (Stargate SG-1, Sanctuary) makes a return to Supernatural, not in her previous role as the angel Naomi, but as a director. “The Future” reminds us that in Supernatural, good and evil are not always absolutes. Dagon (Ali Ahn) has dropped her good helper act with Kelly Kline (Courtney Ford), revealing just how terrifying a Prince of Hell can be—particularly when bearing prenatal vitamins. While Castiel has his own Heavenly plans for Kelly, Sam and Dean come up with an idea that could save both her and her baby. Kelly starts the episode hopeless, but eventually she develops faith in the future baby Lucifer. 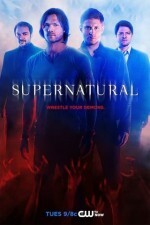 Things don’t go as expected for anyone as Supernatural takes a new turn with Castiel adopting the role of protector. There are some casualties along the way, including a couple of angels and the Colt. As we head towards the end of Season 12, it’s not clear if Baby Lucifer is bound to consume the world or save it. As Kelly tells Castiel, “Nothing is born evil.” Well, we’ll have to see if that’s true. While Robert Berens (“The Executioner’s Song”) has been writing for the series since Season 9, this has been the first season for writer Meredith Glynn (“The One You’ve Been Waiting For.”) The Berens–Glynn writing partnership brings out the best in both of them. Sam’s solution of removing the baby’s grace builds on ideas from the last few seasons. We also get some heartfelt dialogue and the humor we’ve come to expect in Supernatural. This season the Winchesters seem unusually soft-hearted, not wanting to kill Kelly even if she’s carrying the spawn of Satan. Maybe they fear the audience reaction if they keep killing the few women who appear on the series. Which brings us to Dagon, who, as we have been reminded several times, isn’t easy to kill, unless baby Lucifer provides a hand. Ali Ahn plays Dagon with just the right amount of humor and terror. Getting a glimpse of Lucifer (Mark Pellegrino) as he warns Dagon, “Find my boy or the torments I will visit upon you will be infinite,” reminds the audience of why this baby could pose such a threat. As Kelly predicted, Castiel does eventually develop faith in a future in which “this child must be born with all of his power.” Castiel has certainly chosen Team Free Will, but it’s not clear if the Winchesters have been benched. Perhaps we will end up getting a more powerful version of Castiel this season. After all, parenthood has the ability to make one both vulnerable and powerful at the same time. “The Future” shows us that some interesting things are to come on Supernatural as Season 12 heads towards its conclusion. Even if Baby Lucifer is born this season, it seems that his story is likely to continue into Season 13. Are the producers throwing us a hint with the mixtape of “Dean’s top 13 zepp traxx”? Why are there only 13? Let’s hope it’s just a coincidence.